What it does for my hair: It deeply conditions my hair leaving it so soft, moisturized and tangle free. Consistency: This masque has a really pretty peachy pink pearlesecent look to it and it's on the thicker side but still creamy without leaving the hair weighed down and greasy looking. That being said, it does feel rich and luxurious when I'm applying it. Scent: To me this product smells fruity and floral but most of all fresh and clean. I wish the scent would linger on my hair after using it but I don't find that it does. Packaging: This hair product is housed in a brown and green container decorated with flower doodles and I for one am totally sold on pretty packaging. The thing I think is most great about the packaging is that it is a sturdy plastic container with a tight screw on lid and white plastic disc that stays over the product and underneath the lid, protecting the actual conditioner from the moisture and humidity of a shower. Price: I think $33.00 is expensive for a deep conditioner. Since I got it for a good deal at drugstore.com ($24.00) and it's lasted till now with just a dime size amount needed per use, I think it's worth every cent. Especially with the good results I've gotten. It's also available in a smaller size (3.3 Fl oz for $7.99) so it's easy to try it first and see how you like it. Who it would work best for: Anyone that is looking to get added moisture and healthier strands along with some natural shine and frizz taming too. Ingredients: I was pleased when I noticed that the ingredients are paraben free and alcohol free too. My Instructions and Tips: When I use this I start with my regular shampoo (right now I am finishing off my Garnier Pure Clean Shampoo) and wash that out. I then skip my usual step of conditioner and go in with this which I apply mostly to the hair from my ears down focusing on the ends which are most dry. I then let it sit for about 5 minutes before washing it out and towel drying my hair. I was very happy with the results I had with this deep conditioner! It did a good job of nourishing my dry ends and removing hard to brush through tangles, plus it smells so luxurious. The only real downside is the price but I haven't found a hair masque I like as much, ever! 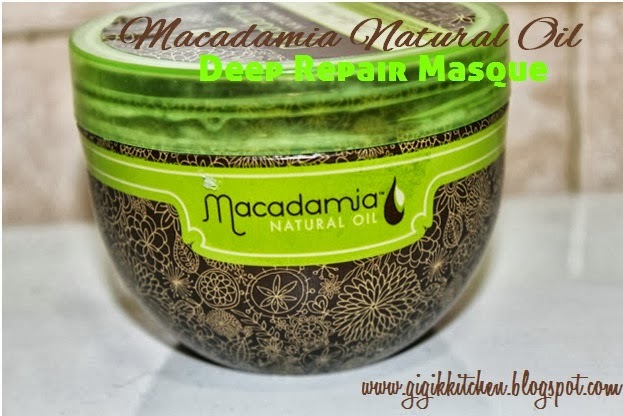 Have you tried this deep repair masque? What did you think of it if you did? What is your favorite hair mask treatment? Let me know in the comments form below- I love getting your recommendations!